This is a very cute video of 11 Month Old Twins Dancing to Daddy’s Guitar. 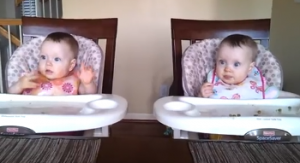 The identical twin girls get so excited whenever the guitar is played. I just think it is great the way they just stop everything and look at eachother and then they start danceing. This entry was posted in Viral Video Of The Week and tagged Viral Video. Bookmark the permalink.